A large class of stochastic optimization problems can be modeled as minimizing an objective function f that depends on a choice of a vector x ∈ X, as well as on a random external parameter ω∈ Ω given by a probability distribution π. The value of the objective function is a random variable and often the goal is to find an x ∈ X to minimize the expected cost E ω [f ω (x)]. Each ω is referred to as a scenario. We consider the case when Ω is large or infinite and we are allowed to sample from π in a black-box fashion. A common method, known as the SAA method (sample average approximation), is to pick sufficiently many independent samples from π and use them to approximate π and correspondingly E ω [f ω (x)]. This is one of several scenario reduction methods used in practice. 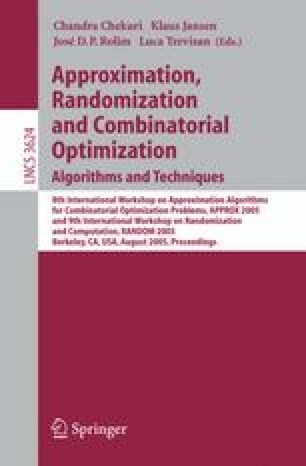 There has been substantial recent interest in two-stage stochastic versions of combinatorial optimization problems which can be modeled by the framework described above. In particular, we are interested in the model where a parameter λ bounds the relative factor by which costs increase if decisions are delayed to the second stage. Although the SAA method has been widely analyzed, the known bounds on the number of samples required for a (1+ε) approximation depend on the variance of π even when λ is assumed to be a fixed constant. Shmoys and Swamy [13,14] proved that a polynomial number of samples suffice when f can be modeled as a linear or convex program. They used modifications to the ellipsoid method to prove this. In this paper we give a different proof, based on earlier methods of Kleywegt, Shapiro, Homem-De-Mello  and others, that a polynomial number of samples suffice for the SAA method. Our proof is not based on computational properties of f and hence also applies to integer programs. We further show that small variations of the SAA method suffice to obtain a bound on the sample size even when we have only an approximation algorithm to solve the sampled problem. We are thus able to extend a number of algorithms designed for the case when π is given explicitly to the case when π is given as a black-box sampling oracle.